Zac is a Murdoch University graduate and utilises the best research evidence when working with patients. He is most interested in managing musculoskeletal spinal pain involving the neck, mid back, low back and sciatic irritation. He is also at home managing all range of sport related injuries. Zac has been working with sporting clubs over the past 3 years, managing injuries and facilitating rehabilitation. Zac is interested in the influence chiropractic adjustments can have on athlete performance. Zachary is excited to help people of all ages in the Maddington area using hands on chiropractic. He is trained in diversified adjustments, activator, dry needling, drop piece, trigger point/massage, kinesiotaping and instrument assisted techniques. 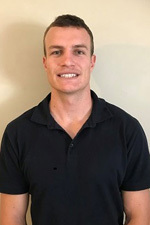 Zac’s goals are to relieve pain for people and reduce the recurrence of pain in the future by working together with patients on active rehabilitation. Outside of work, Zac enjoys surfing, squash and music. He is currently playing in the WAFL for South Fremantle. Call or email today to make an appointment with our chiropractors in Perth.